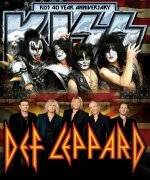 Def Leppard and KISS start their Summer Tour 2014 of the USA and Canada tonight in Salt Lake City, UT. They will play 42 shows starting later tonight in West Valley City/Salt Lake City, UT. KISS will close each night with each band playing for 75-80 minutes. The shows currently run until 31st August 2014 in Houston/Woodlands, TX with a possible stadium date in Mexico City to be added for early September. The tour was announced on 17th March at a press conference in Los Angeles. Below is a listing of the setlist statistics for the Summer Tour 2013. Stay tuned for Live Updates from the first show. 24 full songs were played over the 11 shows plus a partial cover of the Who's 'Won't Get Fooled Again' opening each show as it did in Las Vegas. All songs came from the pool of 37 that were rehearsed and played in Las Vegas. The 'Rock Of Ages' guitar solo was played by Vivian at a number of shows after Phil injured his hand. Joe added the David Bowie 'Heroes' tag to the end of 'Hysteria' during shows on this tour.